Excel supports several automation options using VBA. User Defined Functions (UDF) are relatively simple in that they take inputs and returns a single value. The more powerful option is a macro (or procedure) that can automate just about anything Excel can do. This article will focus on building an Excel worksheet that calls your custom python code. For this example, we are going to develop a simple modeling application that will allow someone to enter an account number and date range then return some summarized sales information that has been transformed via pandas. The solution is simple but shows the power of this combination and how easily you could perform more complex data analysis. For the purposes of this article, I will assume you are running the application on a Windows-based system. I highly recommend you use anaconda (or miniconda) as your distro of choice. xlwings is being constantly updated. This code is based on version 0.7.1. There is a nice xlwings helper function called quickstart which will create a sample Excel file and stub python file for you. The python file is empty and the Excel file looks empty but there has been some behind the scenes work done to make the excel to python interface easier for you. You will notice that there are two modules - xlwings and Module1 . 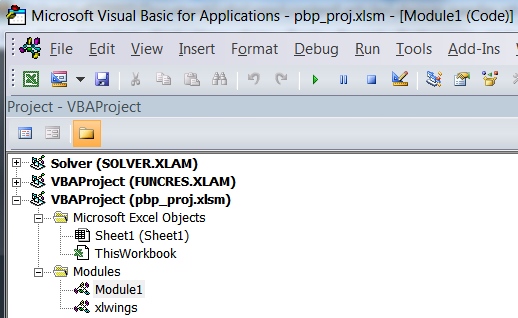 The xlwings module includes all the VBA code to make your custom code work. For the most part you should leave that alone. However, if you have issues with your configuration (like you can’t find python) then you can update the config information in this section. We will modify that in a moment to call our custom code. First, I want to create the Excel input fields. For this application, we are going to allow the user to enter an account number, start date and end date and will manipulate the sales date based on these inputs. I have only made some minor formatting changes, there are no formulas in the cells. Be sure to save the changes to the Excel file. The program is simple and not very useful at this point. I think it is easier to develop a skeleton program in order to make sure all the “plumbing” is in place. The key thing to remember is that the file is called pbp_proj.py and the function is called summarize_sales . 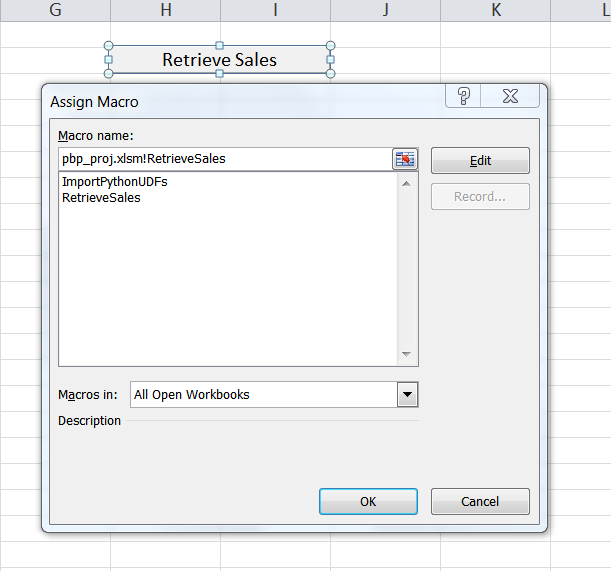 The final piece is to add a button to our sheet and assign it to the procedure/macro RetrieveSales . The basic process is in place. 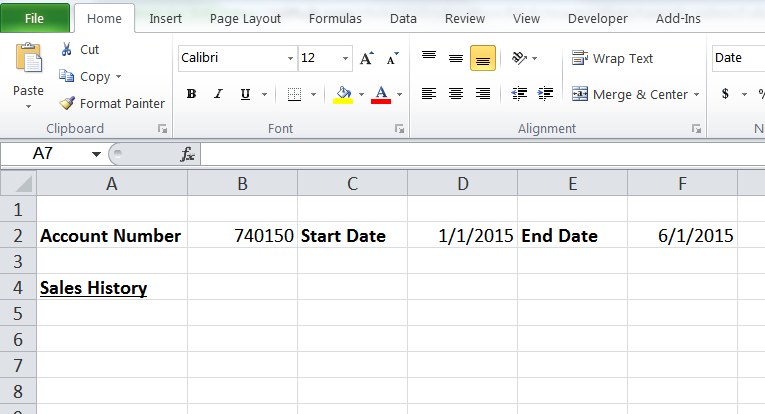 We can read from Excel into a python program and use that to output data back into Excel. Now, let’s make this a little more useful. 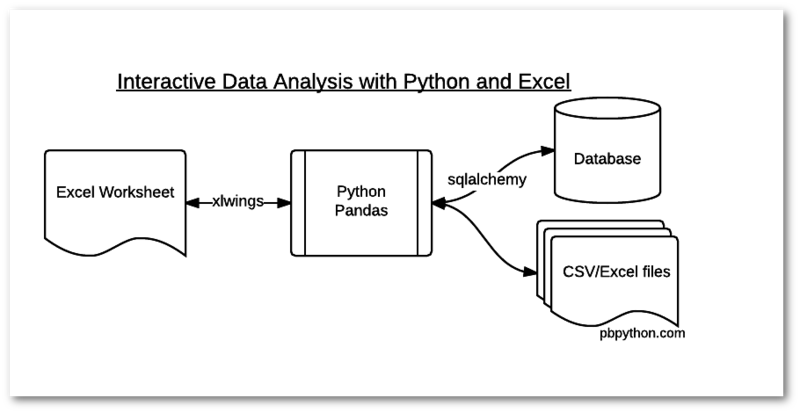 For this example, I’m going to use sqlalchemy to query a small sqlite db and read that query directly into a pandas dataframe. The nice thing about this approach is that if you decide that you want to query another database, you can just change the slqlalchemy engine and keep the rest of your code the same. For reference, the xlwings site shows another example that should be helpful as a further reference. That completes the round trip of data from Excel -> Python -> Excel. All of the data, including the sqlite db is in my github repo. xlwings provides a useful capability to interact seamlessly with Excel from python. By using this code, you can easily build interactive tools for yourself or for less technical users that pull data from multiple sources and analyze it in the very familiar Excel environment. Once the structure is set up, it is really useful to put all your complex logic and data analysis in the python file and harness all the tools available in the python ecosystem. I hope that once you start to play with this, you will find lots of opportunities to use this approach to bring python solutions to some of your less technical users who are stuck using Excel as their only tool for data analysis.